That’s exactly what the room-sized, cosmology-inspired artwork “Island Universe” seeks to portray. The elaborate installation, which is on view at Stanford University’s Cantor Arts Center from Feb. 23 to Aug. 19, was created by artist Josiah McElheny and designed in collaboration with David Weinberg, Distinguished University Professor and chair of the Department of Astronomy. The unlikely pair began collaborating in 2004 when McElheny was a resident artist at Ohio State’s Wexner Center for the Arts. 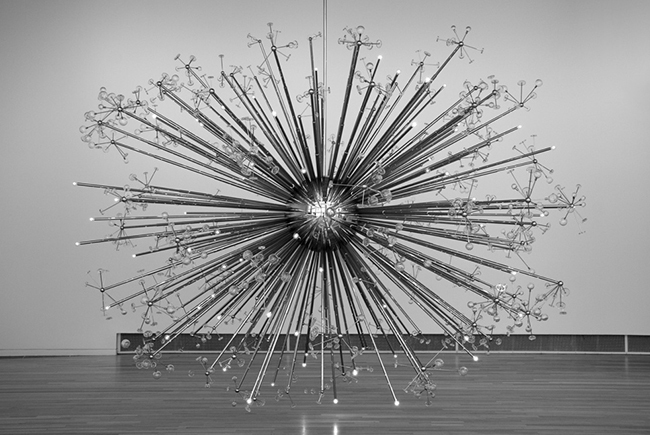 McElheny sought Weinberg’s guidance on his quest to make a sculpture reminiscent of the chandeliers at the New York Metropolitan Opera House that also depicted a scientifically accurate view of the Big Bang, as the chandeliers were made the same year astronomers discovered clear-cut evidence for the Big Bang theory (1965). “I expected it would be lunch plus a few more conversations, but it ended up becoming a quite involved collaboration as we figured out how to design this chandelier that would represent the whole history of the universe,” Weinberg said. He eventually developed computer codes based on precise measurements of the origins and structure of the universe to generate a design for the 2000-piece sculpture. That sculpture, “An End to Modernity,” paved the way for four additional projects between the artist and scientist, culminating in the biggest and boldest piece — “Island Universe.” The five-sculpture work is a visual interpretation of a theory called eternal inflation, in which the universe consists of many universes with different properties. Each of the five sculptural elements in “Island Universe” represents a potential one of these universes and was modeled using variants of the computer language Weinberg created for “An End to Modernity.” Although the eternal inflation theory could allow universes in which the laws of nature have changed, Weinberg and McElheny wanted to create five universes that had familiar enough properties to use their established visual architecture and that also represented something plausible in terms of physics. 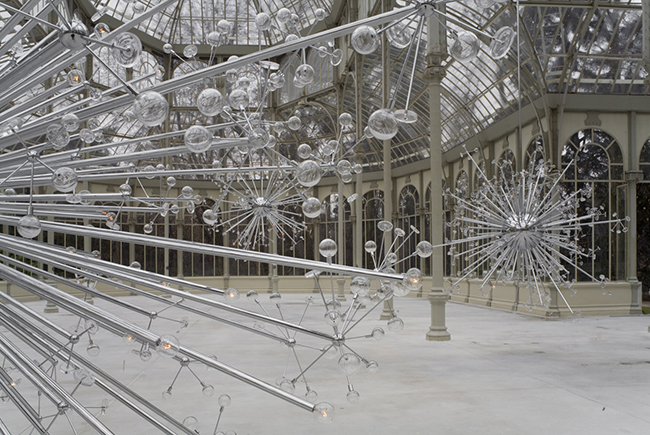 The collective “Island Universe” sculpture — made of chrome-plated aluminum, hand-blown glass and electric lamps — is suspended from the ceiling, with each element based on detailed calculations. The sculpture at the center is titled “Heliocentric,” formed in the image of our universe. “Late Emergence” represents a universe in which a dark age lasting billions of years delayed the growth of the first stars and galaxies. “Frozen Structure” embodies a universe that began with more dark energy relative to dark matter, freezing the growth and clustering of galaxies soon after they started to form. In “Small Scale Violence,” galaxies start to form early and intensely, leading to frequent collisions. And perhaps the most unconventional is “Directional Structure,” in which galaxies and quasars form only within a disc-shaped zone — a cosmic super-galaxy. The name “Island Universe” is a nod to philosopher Immanuel Kant, who was the first to speculate that distant nebulae were actually other galaxies like the Milky Way — “island universes” scattered throughout the emptiness of space. 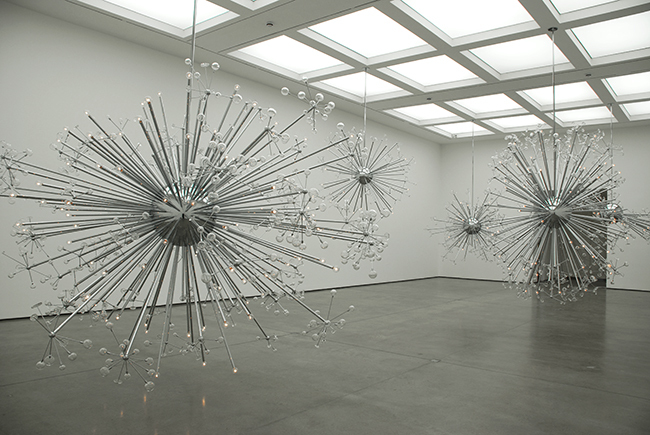 Since its completion in 2008, “Island Universe” has been exhibited in Boston, London and Madrid, among others. The installation’s appearance at Stanford is its first on the West Coast. Stanford is also home to physicist Andrei Linde, who developed the theory on which the artwork is based. He and McElheny will give a joint talk at Stanford on March 2 about “Island Universe” and their longtime collaboration.